Ground Penetrating Radar Systems’ of Knoxville, Tennessee was able to work with an Environmental Company to clear boring locations of underground utilities and scan for an Underground Storage Tank. GPRS uses Non-Destructive testing equipment to locate piping, power-lines, underground storage tanks, and grave sites that are unable to be seen. Using GPRS is a safe, cost effective way to make sure you can safety drill or dig and not destroy any underground utilities or determine if UST’s do or do not exist on a property. Other services we offer include: Post-Tension Cable Location, Conduit Locating, Rebar Locating, Void Location and more. 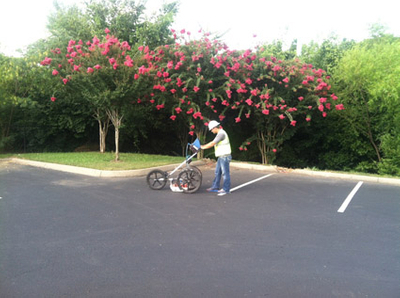 If GPR services are needed in East Tennessee call Dave Schaff at (865) 206-7639 or email at dave.schaff@gprsinc.com.